Traditional banking is being challenged as Fintech entrepreneurs and start-ups take matters into their own hands. This emerging market has seen a burst of activity over the last 5 years, global investment in Fintech tripled to $12.21B in 2014. We analysed the Fintech discussion in a previous blog and we wanted to continue with these reports to show how influencer trends map out over time. It was interesting to see how the rankings have changed since last time, as well as seeing new influencers entering and driving engagement within the fintech community on social media. We were very interested in seeing which fintech professionals and brands were driving engagement within the fintech community, so we analysed over 482K tweets containing the word “fintech” and identified the top 100 most influential brands and individuals leading the discussion on Twitter. We discovered a very engaged community, with much discussion between individuals and brands, joining together in conversations looking to improve their quality of service. Below you can see a network map of the online conversation created with our Influencer Relationship Management software IRM. 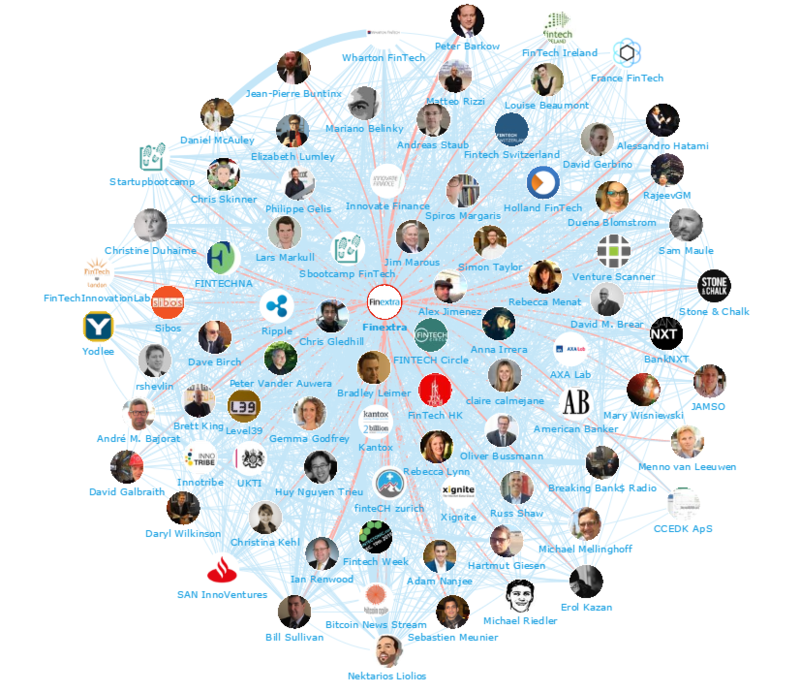 This map shows the number 2 influencer Jim Marous at the centre and the conversations to and from all the influencers in his field. Be sure to click on the map to enjoy the full size network diagram in greater detail. Below you can see another network map created in IRM (Influencer Relationship Management software) showing the #7 Brand Finextra at the centre and the conversations to and from the different influencers in their field. As you can see it is a very engaged community with many conversations. If you are interested in learning more about identifying, managing and engaging with influencers click here to get in touch! 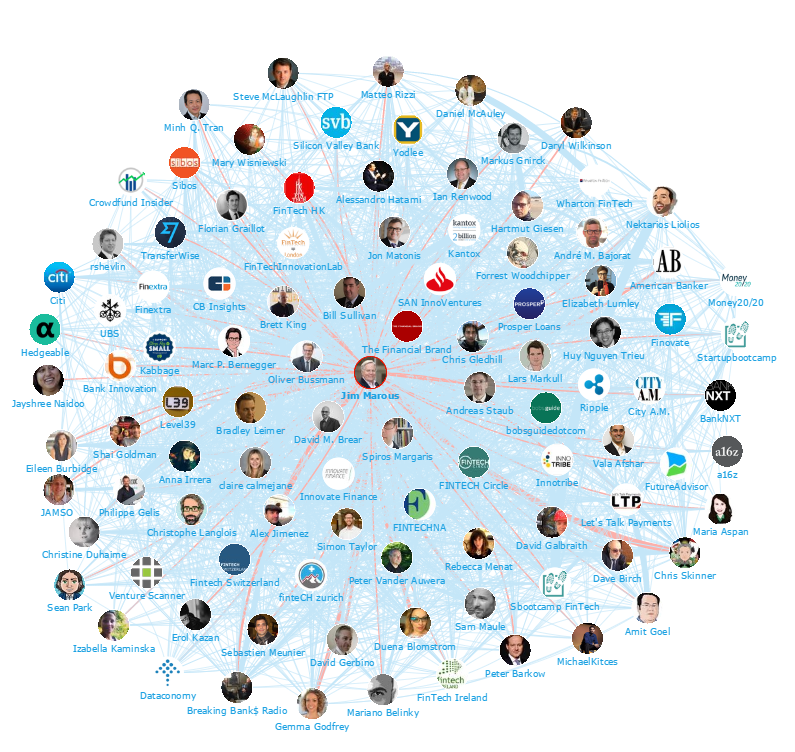 We looked at all the individuals engaging on Twitter to bring you a list of the top 100 influencers in Fintech. Be sure to hit the download now button below to download the full report. With all the discussion and resources available online, our analysis produced a great set of independent information resources and communities. It was interesting to see influential brands such as DNotes, Fintechna, Bitcoin Garden and Hedgeable leading the debate. Be sure to download the full analysis for free to get an idea of who are most influential fintech brands! Disclaimer: As ever with these lists, it must be stressed that the ranking is by no means a definitive measurement of influence, as there is no such thing. 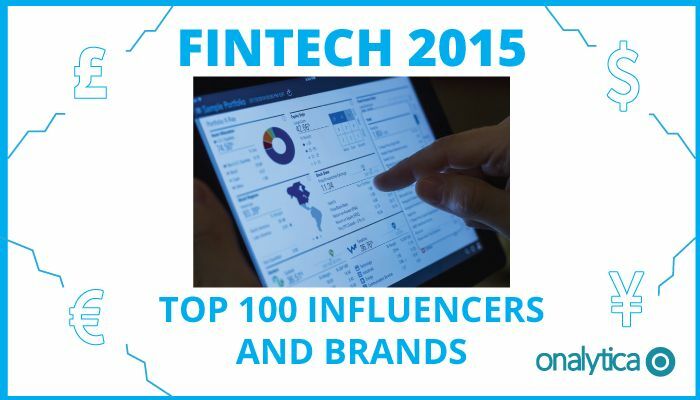 The brands and individuals listed are undoubtedly influential when it comes to driving discussion around fintech. The PageRank based methodology we use to extract influencers on a particular topic takes into account the number and quality of contextual references that a user receives. These calculations are independent of a user’s number of followers, but we do filter our lists based on how much a user is engaged in the conversation and the influence they drive through their networks.